So it is Friday! Who is excited to get their weekend on?? Put y’alls hands down. I for one am so pumped that the weekend is here and even though I have practice all day tomorrow I am already looking forward to ample sleep (and run) time on Sunday! 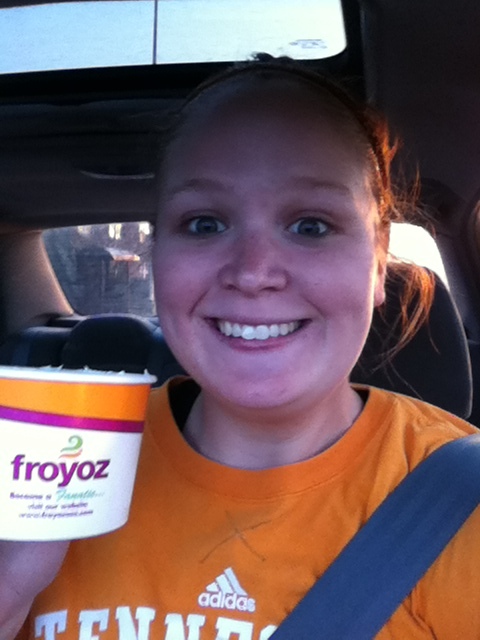 Froyoz to celebrate the weekend! Going back to my 2012 goals, one of them was to complete a full marathon this year. Rowing sort of put that goal on the backburner so I sat long and hard and thought about some other major goal that I could begin working towards. Two weekends ago while killing time at the exchange zone at Whitestone Relay, I got to talk to a fellow track club member. She is part of the Marathon Maniacs and was telling me all about her big goal of doing a half in every state. I asked a few questions then she suggested I check out the Half Fanatics since it is geared towards halfers. After browsing the website for a bit I quickly sent in the needed criteria info in hopes of being accepted. Shortly after that, my acceptance was confirmed and I was so excited! 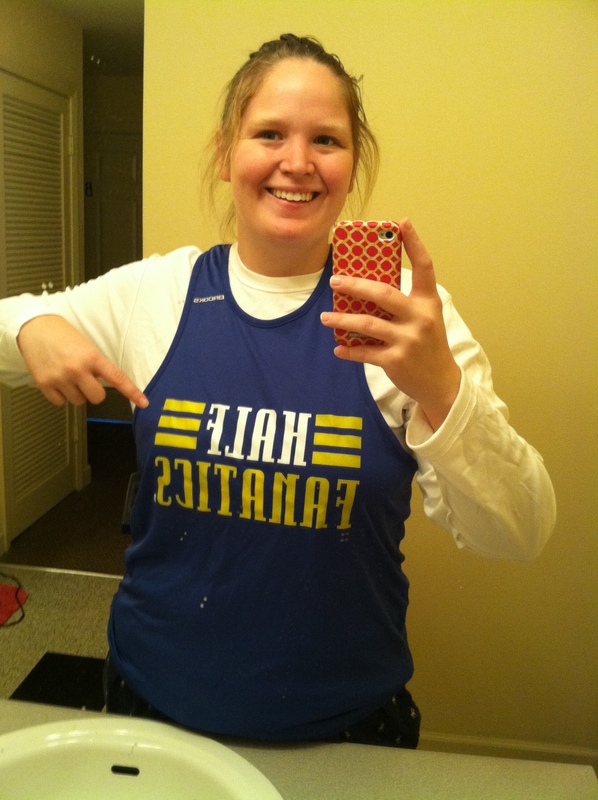 Half Fanatics is a club/group in which people can share together their love for halfs. Race calendars are available and lots of meet up opportunities. You gain levels (moons) by completing certain criteria. You can move up in levels by doing a certain amount of halfs within a certain time frame or doing a certain number in different states in a certain time frame. This is just what I needed to get started on my goal. My sweet map that Michelle printed for me! Ready to color those babies in! I have been stalking marathon websites nonstop and have came up with several halfs that I hope to knock off this fall. 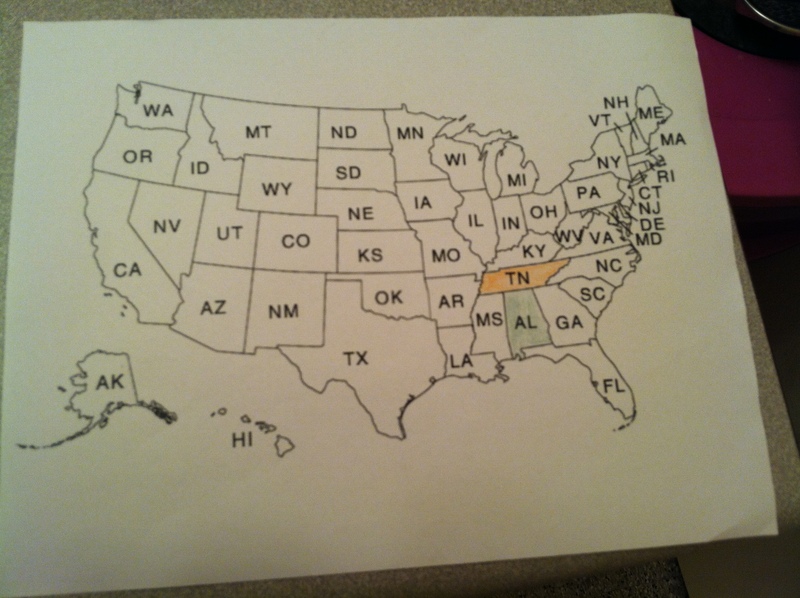 My goal is to do as many states is possible from June 2012-June 2013. I realize that I have a lot of time to accomplish the every state goal (like, umm, my whole life) but I really want to set this short(er) term goal and see how many states I can beast. The goal is simply to finish; I’m not shooting for PRs or anythin–at least not on most of them. The best part is going to be meeting new people! I’m already planning on driving halfway across the country TWICE to do two seperate halfs with my wonderful blogfriend Kelsey. She rows too–pretty sure we are best friend soulmates. represent! oh and ignore the flyaways. So that is what is up with this Fanatic Friday! Wish me luck! Do you have a 50 state goal? Any halfs (outside of Tennessee) that you can recommend? Want to do one TOGETHER?? Or just offer me a couch to crash on? 🙂 happy weekend!! My husband and I ran our first half marathon (Cincy Half) in Cincinnati, Ohio back in October of 2011 during my fall break. It was a great course! A little chilly at the start, but perfect running weather since it was October. Oh, and it was on a Saturday- which was nice since it was spring break and we had Sunday to travel back home. Highly recommended. obviously you know i’m a 50 stater- this month I’m doing NY which will be my 25th state and 1/2 way point!! One of the great parts abotu living in TN is that its a short state so I was able to drive to majority of mine last year. Let me know if you have any questions— if i haven’t ran the race you’re looking at, chances are I’ve at least read about it. Somewhere down the line I need to do Virginia, which I’ll be driving to- whenever I choose that one, I’ll let you know. In the meantime- if you click on my “what’s next” tab on my blog thats where I put what I’m planning on doing for future races. Recommend the McDonald’s Half in Richmond, VA: good course, very well-organized, great race support and fun crowds. Omigosh, yes. I was so delusional to think rowing wasn’t a viable training method-what was I thinking?!! It is so tough and now I have an affair going with the ergo and the TM is jealous! ha!! So so so cool that you row for U of Tenn. AWESOME!! Can it be September already?!?! So excited to run with you!